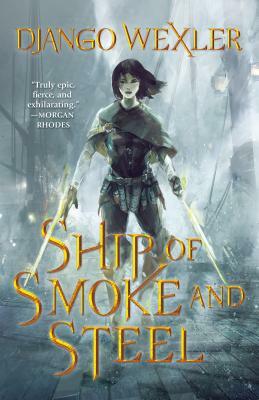 Ship of Smoke and Steel is the launch of Django Wexler's cinematic, action-packed epic fantasy Wells of Sorcery trilogy. In the lower wards of Kahnzoka, the great port city of the Blessed Empire, eighteen-year-old ward boss Isoka enforces the will of her criminal masters with the power of Melos, the Well of Combat. The money she collects goes to keep her little sister living in comfort, far from the bloody streets they grew up on. When Isoka's magic is discovered by the government, she's arrested and brought to the Emperor's spymaster, who sends her on an impossible mission: steal Soliton, a legendary ghost ship—a ship from which no one has ever returned. If she fails, her sister’s life is forfeit. On board Soliton, nothing is as simple as it seems. Isoka tries to get close to the ship's mysterious captain, but to do it she must become part of the brutal crew and join their endless battles against twisted creatures. She doesn't expect to have to contend with feelings for a charismatic fighter who shares her combat magic, or for a fearless princess who wields an even darker power. Django Wexler is a self-proclaimed computer/fantasy/sci-fi geek. He graduated from Carnegie Mellon University with degrees in creative writing and computer science, worked in artificial intelligence research and as a programmer/writer for Microsoft, and is now a full-time fantasy writer. Django is the author of The Shadow Campaigns, an epic fantasy series for adults published by Roc (an imprint of Penguin), and The Forbidden Library, a classic fantasy series for young readers published by Kathy Dawson Books (an imprint of Penguin Young Readers Group).